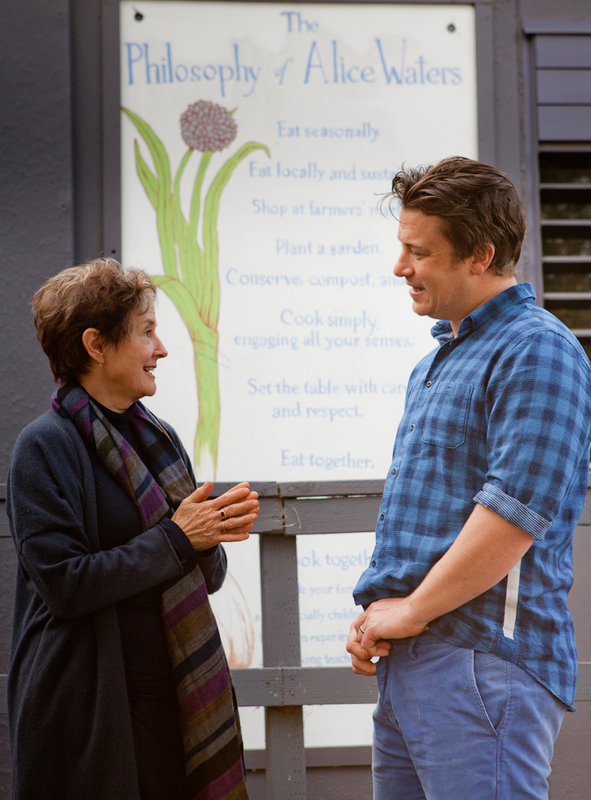 Jamie Oliver swings by the Edible Schoolyard in Berkeley for a tour will fellow school food advocate Alice Waters. 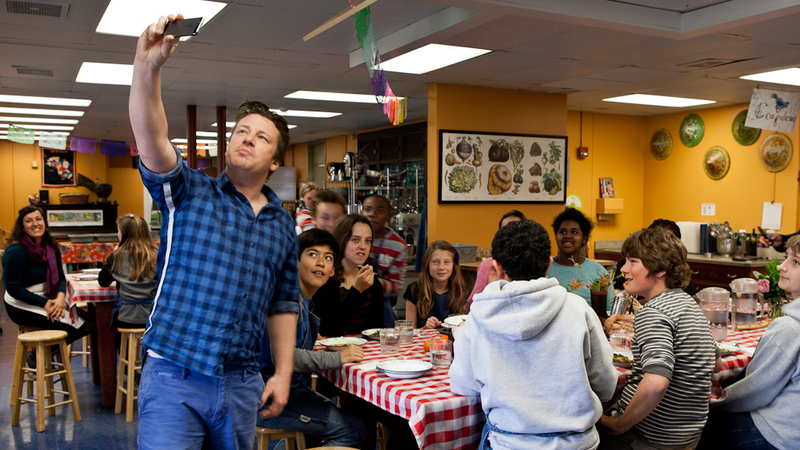 Without fuss or fanfare, Brit school food rock star Jamie Oliver, best known in the United States for his Emmy-award winning ABC TV series Food Revolution, slipped into the first cooking class of the new year at the Edible Schoolyard in Berkeley, where black-eyed peas were on the menu. 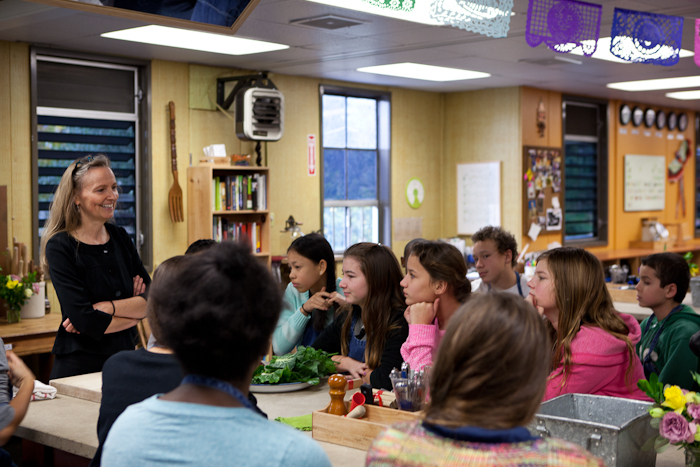 Despite frequent meetings with U.S. school food crusader Alice Waters over the years, this was Oliver's first trip to the renowned school cooking and gardening program at Martin Luther King, Jr. Middle School in Berkeley. Oliver seemed a little confused about where he was -- with his references to "San Fran" and high schoolers, common and understandable cultural gaffes. Nonetheless he won over the 7th graders, who seemed suitably unfazed (we're talking teens after all) that a celebrity chef was quizzing them about ingredients and techniques and making a video on the fly with a group of students who walked him through the recipe and how it related to classroom curriculum. A father of four and something of a ham in front of the camera, Oliver seemed especially jazzed when connecting with the adolescents around the table and in front of a smartphone. 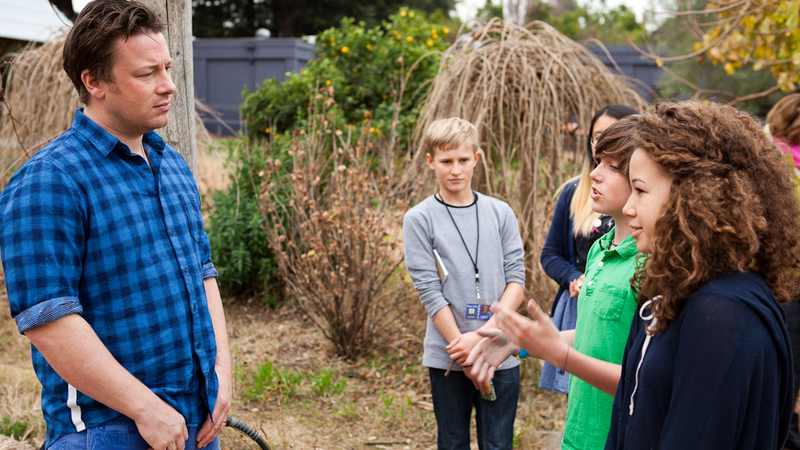 "It's great to finally have the chance to see this program in action," said Oliver. "It's a beautiful and lovely thing and every school child should have access to this kind of education," said the restaurateur who launched similar programming in Britain and won a Ted Prize award for his work to educate kids about food, inspire families to return to cooking at home, and empower those fighting against obesity. Oliver's considerable edible entrepreneurial empire includes books, TV series, restaurants, food and homeware products, and a party planning business. 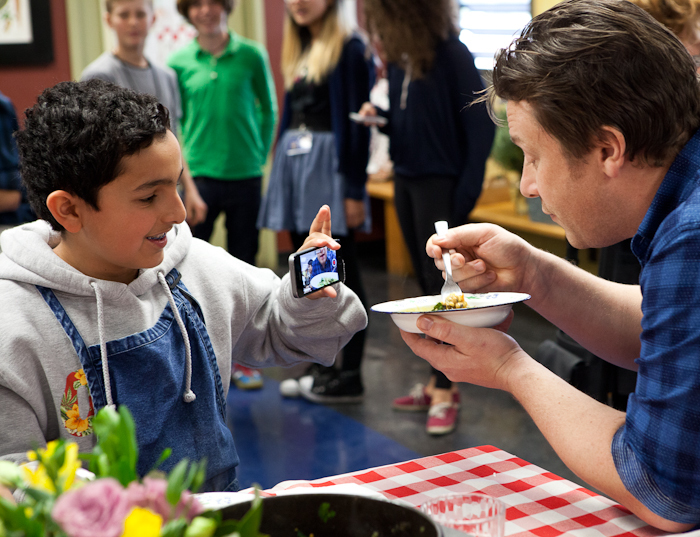 Jamie Oliver gets hands-on and interactive with students in the kitchen at the Edible Schoolyard in Berkeley. Teacher Julie Searle's history classes have been learning about the Columbian Exchange, the widespread transfer of goods, culture, people (including slaves), technology, and ideas between the Americas and the Afro-Eurasian countries following Christopher Columbus's voyage in 1492. Longtime cooking teacher, Esther Cook, explained to students how foods like tomatoes came to Italy as the result of the opening of trade routes. For several years now, proponents of edible education have worked to closely align cooking instruction with academic learning. "I wish we could just explore food for food's sake in this classroom, but it's not where we're at in the current state of education," said school principal Janet Levenson. "That said, linking cooking experience with classroom learning creates a buzz around school and reinforces the curriculum. They're both good things." Cook went on to talk about how black-eyed peas, a popular African food, came to be a Southern tradition in the U.S. among slaves and freed black folk alike. "When you're far from home, the taste of something familiar is so powerful," she said. The recipes for the day (see below) were adapted and inspired by New York chef Marcus Samuelsson, who Cook called his own "personal Columbian Exchange," since he hails from Ethiopia, was adopted by a Swedish couple, went to school in London, and moved to the U.S. where he opened the restaurant Red Rooster Harlem. "He draws on a lot of global inspiration in how he approaches food." Oliver is in the Bay Area for meetings with like-minded food reformers and the staff who run his U.S. campaign Food Revolution. The campaign launched in conjunction with his TV shows that focused on improving school food and the eating habits of American families in Huntington, West Virginia and Los Angeles. He won't make stops in those locations but will fly up to Seattle to meet with representatives from the Bill & Melinda Gates Foundation, said an aide. While in town he stopped by a San Francisco classic, Tosca Cafe, and dined at stylish newbie The Cavalier on Monday night, with lunch the same day at Chez Panisse, of course. Today, he's scheduled to have meetings in Sacramento, including with Governor Jerry Brown. His Jamie Oliver Food Foundation has partnered with The California Endowment to bring food education and free cooking classes to underserved Californians via his Big Rig Mobile Kitchen Classroom, launched last September in Madera, California. The moveable cooking classroom starts the new year in Sacramento and then heads to Merced, Los Angeles, and San Diego. The rig offers a five-week course in affordable meals made with fresh whole ingredients. Oliver conceived the mobile truck idea as part of his TED Prize; TED supporters coughed up $500,000 to build the rig. Meanwhile, Waters and Oliver welcome the opportunity to collaborate more closely. 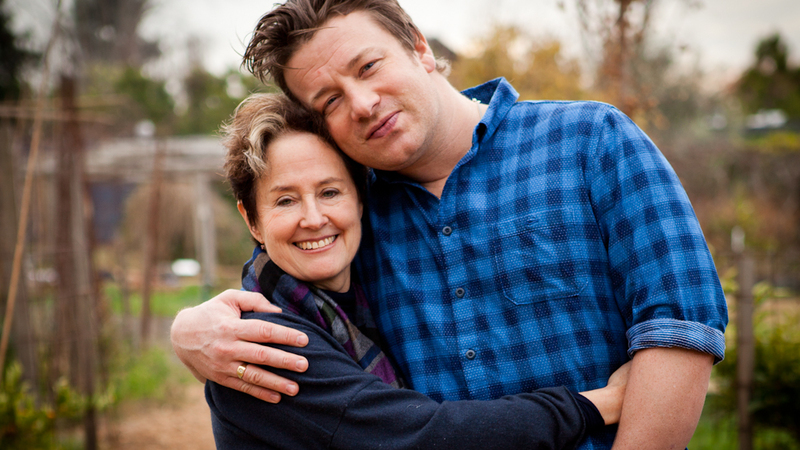 "Jamie Oliver is particularly skilled at teaching and working with food service staff to engage with children, we'd love for him to come and hold a masterclass for them here," said Edible Schoolyard director Katrina Heron. "Anyone who works with food service in a school setting is an educator in our minds. We need to honor our food service staff." For his part, Oliver said it's important for many chefs with varying talents and similar goals to come together around improving the eating habits of children and adults alike. "In some ways it's easier to make a difference in the U.K., we are a fraction of the size and have a quarter of the population and we don't have to contend with the big agri-farming companies in the U.S.," said Oliver. "But we're starting to see significant change here in the U.S., and it takes a ton of people working in complementary but also different ways to get things done." After a quick spin through the garden, where the smell of roasting vegetables wafted in the air, it was back into the kitchen classroom to see what the kids had cooked up. 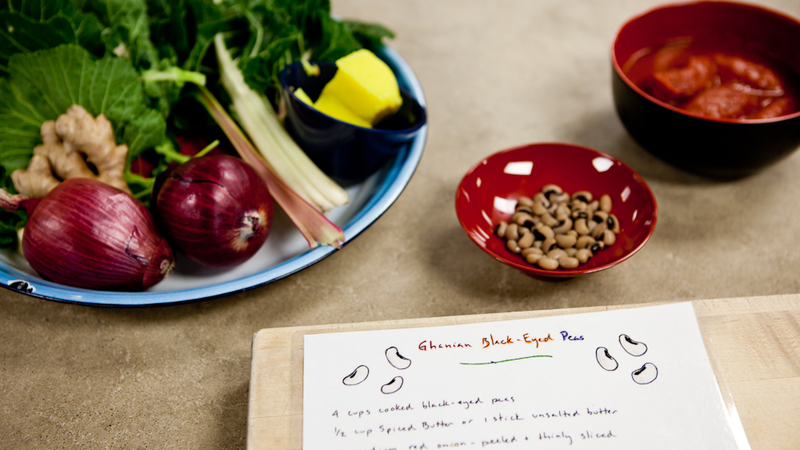 This being the Edible Schoolyard, the black-eyed peas were accompanied by collard greens, kale, and chard. "You know us, unless we're making a cup of tea we put greens in everything," joked Cook. Oliver declared the nicely-spiced dish "absolutely delicious." And it was. Recipes courtesy of Edible Schoolyard, adapted from recipes by Marcus Samuelsson. Melt butter over medium heat in a heavy-bottomed pot. Add onion and sauté for 2-3 minutes. Add tomatoes and chili flakes, stir well, and cook for a few more minutes. Add garlic, ginger, Berbere, coconut milk, and turmeric and bring to a simmer. Add black eyed peas, water, and salt to simmering mixture. Cook on simmer for 8-10 minutes. Stir in cilantro and scallions before serving. Melt the butter in a medium saucepan over low heat, stirring frequently. Skim and discard foam as it rises to the top. Continue cooking, without letting the butter brown, until no more foam appears. Add onion, garlic, ginger, fenugreek, cumin, cardamom, oregano, turmeric, and basil. Continue cooking for 15 minutes, stirring occasionally. Remove from heat and let stand until the spices settle. Strain through a fine-mesh sieve before using. Finely grind the fenugreek seeds with a mortar and pestle. Stir together with the remaining ingredients in a small bowl until well combined.